An experienced trial attorney who has handled complex cases through litigation to trial or settlement, often achieving seven-figure results. Few individuals or law firms can compare with the fusion of experience, skills and education offered by Philadelphia medical malpractice attorney Leon Aussprung. Whether your case involves medical negligence or catastrophic injury or death arising from an auto accident, construction/work accident, bad product, premises liability or other negligence, Dr. Aussprung's extensive knowledge of medicine and his legal experience will be an asset to your legal representation. In late 2017, Dr. Aussprung obtained a $15 million settlement on behalf of a worker, who was catastrophically injured in an industrial workplace fall accident. While Dr. Aussprung is proud of the results he has obtained for clients as a Philadelphia medical malpractice lawyer, his goal is not just to obtain compensation for the death of your loved one or for your permanent injuries, but also to personally guide you through the complex and often confusing civil justice system. 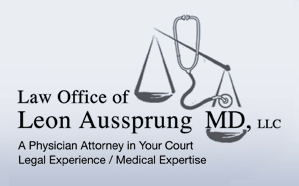 Dr. Aussprung handles multi-million dollar cases, but every client he represents, regardless of the value of his or her case, gets his personal attention. Dr. Aussprung's office is located in Philadelphia at 1429 Walnut Street, but his practice is not limited to Philadelphia cases. Leon Aussprung has successfully litigated cases throughout Pennsylvania, including Allegheny County (Pittsburgh), Dauphin County (Harrisburg), Lakawanna County (Scranton), Lehigh County, Indiana County, Centre County, Montgomery County, Delaware County, Chester County, Lancaster County, Clearfield County, and many other counties, as well as throughout New Jersey. Dr. Aussprung has litigated numerous medical malpractice cases involving complex medical issues such as: brain injured infants from improperly managed deliveries; a brain injured mother from an improperly performed D&C; delayed and improper treatment of infections, including meningitis; improper hospital I.V. fluid management; improper treatment of deep vein thrombosis; delay in treatment of cauda equina syndrome; delay in treatment of heart attacks and strokes; improper management of anesthesia; delayed and improper treatment of seizures in adults and children; delayed and improper treatment of diabetes; delayed treatment of bleeding; delayed diagnosis and treatment of placental abruptions; delayed diagnosis and treatment of necrotizing enterocolitis; twin birthing issues; fertility treatment complications; improper midwife care; brachial plexus and nerve injuries; improper blood transfusions; and failure to inform about and treat HIV. If you or a loved one have been the victim of medical malpractice or suffered permanent injuries from someone else's negligence, ask Philadelphia medical malpractice attorney Leon Aussprung about your legal rights and have him fight for justice on your behalf.